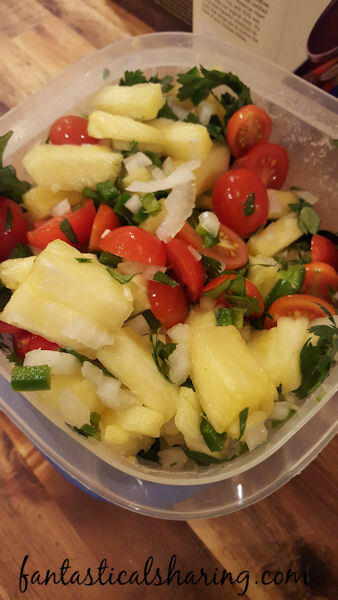 This fruity pico de gallo is perfect on chicken and pork -- or even chips for a snack! Pico de gallo is the perfect "accent" for so many dishes. It's great on fajitas and tacos. It's the bomb on a plate of nachos. It goes well on grilled chicken or slow cooked pork. You can also dig in with a cracker or chip and enjoy it that way. 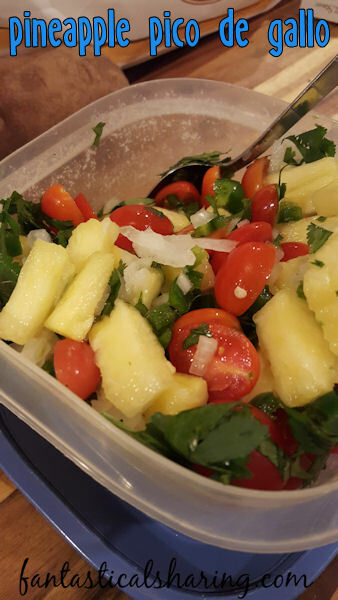 This pico de gallo also contains arguably the best fruit ever..PINEAPPLE. I used grape tomatoes instead of dicing up some tomatoes (mostly out of laziness). We used the pineapple pico de gallo as a topping for chipotle chicken and cheese quesadillas - I am posting that recipe tomorrow. :) So whether you enjoy it on quesadillas or eat it by the spoonful - this is a fabulous recipe! UPDATE: here is that link to the Chipotle Chicken & Cheese Quesadillas recipe. Combine all ingredients together and refrigerate for 1 hour to let flavors meld together. Serve up on chips, with pork or chicken for a meal, OR stay tuned for the chipotle chicken & cheese quesadilla recipe coming tomorrow! 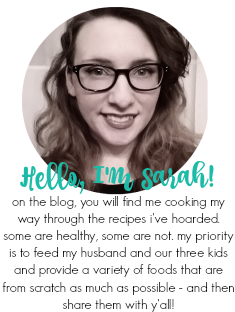 I will update with a link as soon as it goes live.